The construction date of the earliest castle at Listowel dates to the 13th century but the present castle was probably built in the 15th century by the FitzMaurices. The castle stands on an elevation on a steep bank, overlooking the river Feale, above the location of a strategic ford. A substantial part of the front of the castle survives consisting of two large, square towers of four storeys, standing almost to the original height of 15.3 metres, connected by a wall of the same height and linked together by an arch on one side. A major programme of conservation works has been undertaken at the castle including the provision of an external staircase to allow public access to the upper levels. Location: Listowel town centre The Square. Please note site is very restricted and can only accommodate groups of 12. All tour groups must pre-book. The Tides B&B in Ballybunion has special offers to suit most budgets to meet with the current climate we live in. 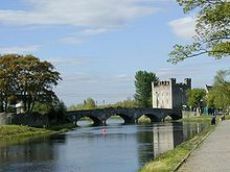 So why not make a weekend or midweek break and include a Listowel Heirtage Day at Listowel Castle as part of your get away package.